October 31 is known as Reformation Day because it was on this day in 1517 that Martin Luther posted Ninety-Five Theses on the door of the Castle Church in Wittenberg, Germany. The Ninety-Five Theses were issues that Luther thought should be debated by the theologians. These questions were brought about due to the sale of indulgences and general corruption within the Roman Catholic Church. The term Protestant was not used to describe those who aligned themselves with Luther for another 12 years, but the Protestant movement can be dated the the event at Wittenberg. There are many issues on which I would differ with Luther, but I admit that I admire the man and the stand that he took against practices of his day which were departures from the Apostolic doctrine. 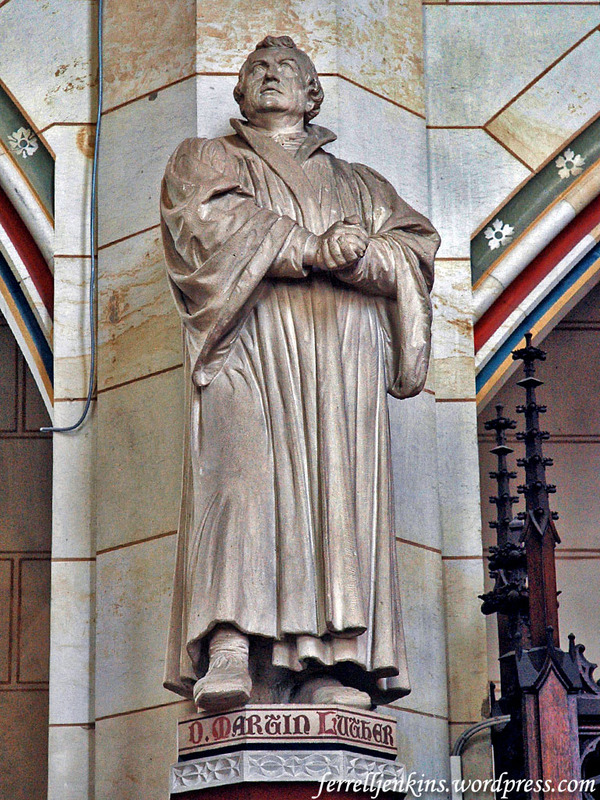 This statue of Luther stands in the Castle Church in Wittenberg, Germany. The official name of the town is Lutherstadt Wittenberg. Luther Statue in the Castle Church in Wittenberg. Photo by Ferrell Jenkins. Our Alpine Europe tour visited Worms, Germany, in 2015. At that time the park where the Luther Monument is located was under repair in anticipation of the 500th anniversary of the Reformation. I was able to crop out the repair work and keep a nice photo of the Monument. This Monument in Worms, Germany, is the largest Luther Monument in the world. The park has been under repair for the 500th anniversary. Photo by Ferrell Jenkins. In preparation for that tour I found this description of the Luther Monument here. The link is now broken, but the site still includes a photo of the Monument here. The Luther Monument in Worms is the largest Luther Monument in the world. The elaborate sculpture group centers on Martin Luther, who is flanked by Frederick the Wise of Saxony and Philip of Hesse, two powerful princes who played a major role in the political success of the Reformation. Behind Luther are Johannes Reuchlin and Philipp Melanchthon, two important Protestant scholars, and at his feet are forerunners of the Reformation: Peter Waldo, John Wycliffe, Jan Hus and Girolamo Savonarola. 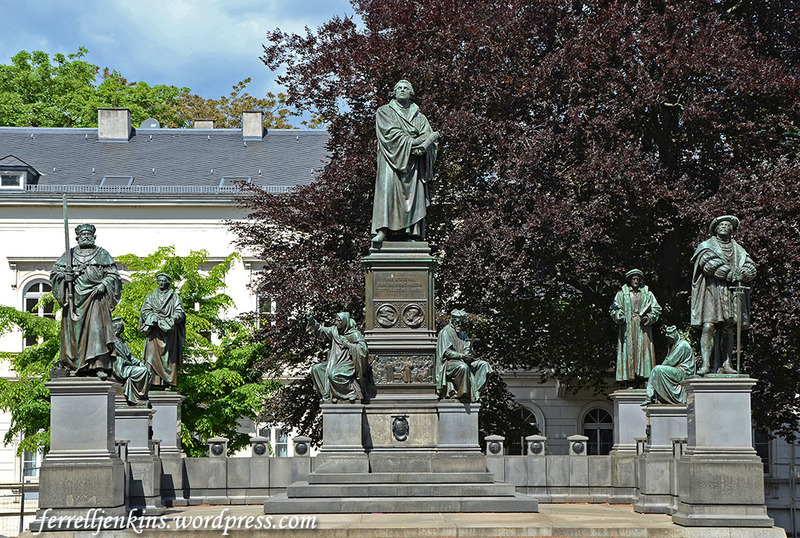 The seated women personify the first German cities to adopt Protestantism and between the wall and the statue of Luther are the names of other towns that played an important role in the Reformation. We have photos and bits of information about other Reformation leaders scattered here and there on the blog. You may search for the Reformation, or some specific leaders such as Savonarola, Zwingle, Knox, Bullinger, Restoration Movement, etc. Steven Braman, a friend and fellow-traveler/blogger, travels to Germany in his work. He has written several posts about the Reformation. Begin here and find a list of his most recent posts. The Citadel at Jaffa (Joppa) Gate in the west wall of the Old City of Jerusalem provides one of the most distinctive and memorable views of the city. This view of the Citadel was made from the west, looking across the north-south stretch of the Hinnom Valley. Photo by Ferrell Jenkins. The distinctive square tower (with the flag) is popularly known as the Tower of David, even though the Citadel never had anything to do with David. Left: The tower of Phasael, Herod’s brother. This is the tower now known as the Tower of David. It has been dated to the Herodian period, but scholars differ over whether it should be identified with Phasael or Hippicus towers. Herod the Great reigned from 37-4 B.C., but his “period” could be thought of as continuing until the destruction of Jerusalem by the Romans in A.D. 70, and overlapping with the Roman period. The Roman period could be considered from the entrance of Rome into the country to the beginning of the Byzantine period (64 B.C. to A.D. 324). Center: The tower of Hippicus, Herod’s friend. Right: The tower of Mariamne, named for the favorite wife of Herod whom he later murdered. 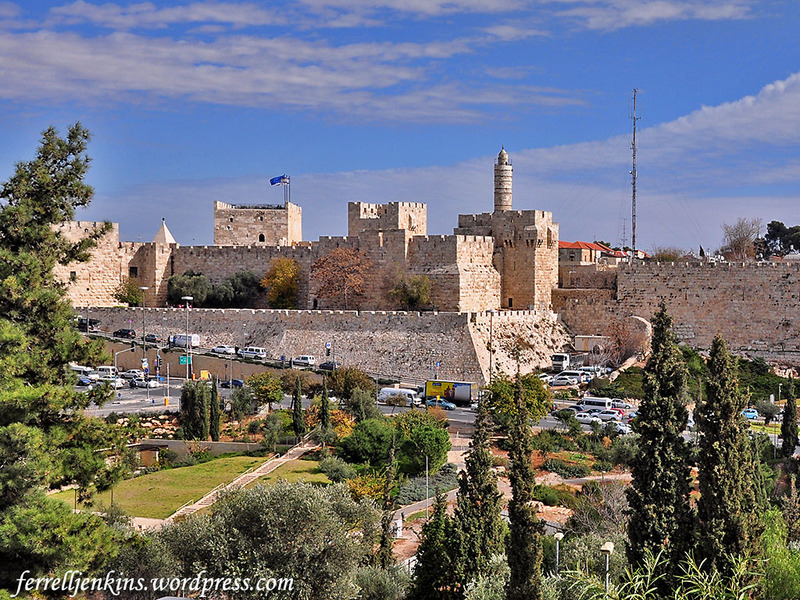 Josephus describes these towers in The Jewish War V:161-183. The three towers of the Citadel from the time of Herod the Great. Photo by Ferrell Jenkins. Our next photo provides a nice aerial view of the present condition of the Citadel. On the left you see Jaffa Gate, the only entrance to the Old City from the west. Notice the red-roofed building on the extreme right of the photo, with parking further to the right. That is the Kishle, the Old City Police Station. More about that in a future post. 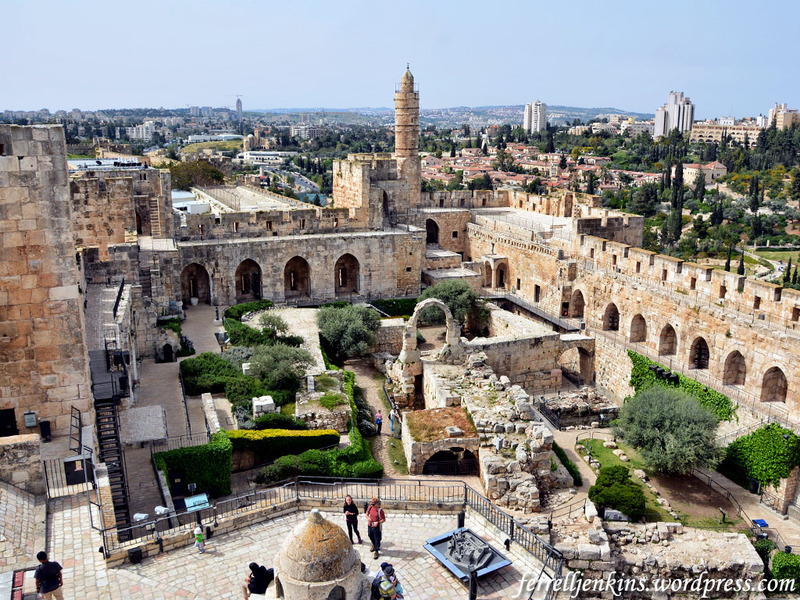 The Tower of David Museum is housed in the Citadel. The TOD web site may be accessed here. Click on Citadel for information related to this post. Aerial photo of the Citadel. Photo by Ferrell Jenkins. The Citadel has undergone several archaeological excavations. Here is a brief list as discussed by Renée Sivan and Giora Solar in Ancient Jerusalem Revealed, ed. by Hillel Geva (1994). Extensive survey by Conrad Shick in 1898. The first archaeological excavation was conducted by C. N. Johns, on behalf of the British Mandatory Department of Antiquities, 1934-1947. Jones “exposed the outer north and west faces of the First Wall (8th century B.C.) comprising four phases of construction.” On the eastern, inner side of the wall, he found material from the Roman period. Hillel Geva excavated the southern part of the Citadel courtyard between 1976-1980. Sivan and Solar excavated several portions of the Citadel. To summarize, within the Citadel we have ruins which belong to the Iron Age (8th century B.C. ), Hasmonean Period (late 2nd to early 1st century B.C. ), Herodian Period (late 1st century B.C. to A.D. 70), Roman Period (64 B.C. to A.D. 324), Byzantine Period (4th to 7th centuries A.D.), the Early Arab Period (8th-9th centuries A.D.), the Crusader Period (A.D. 1099-1260), the Mamluk (A.D. 1260-1517) and Ottoman Periods A.D. 1517-1918). See the chapter by Hillel Giva in Jerusalem Revealed (1994) for more details. (Dates are those used by Max Miller, Introducing the Holy Land). 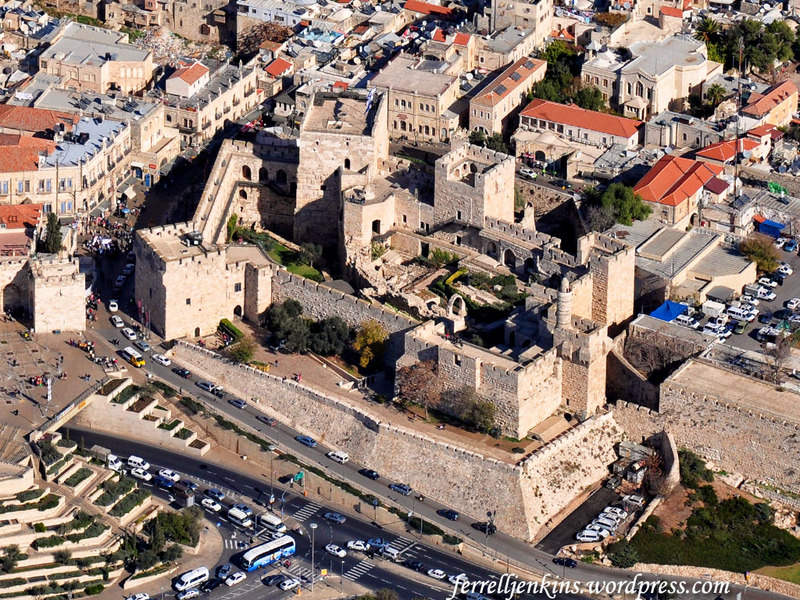 The photo below provides a view of the interior of the Citadel from the Tower of David. Within this area we have ruins from the various archaeological/historical periods mentioned above, covering a period of about 2700 years. Interior southwest view of the interior of the Citadel from the Tower of David. Photo by Ferrell Jenkins. 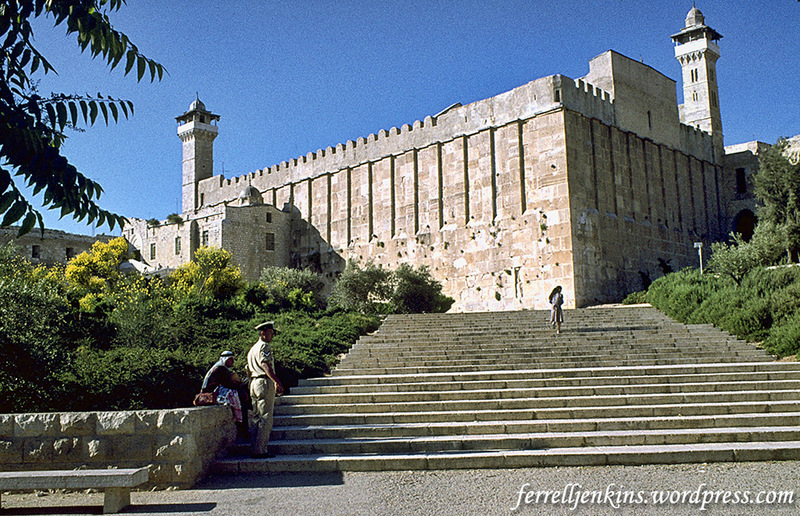 Before leaving the article by Sivan and Solar, allow me to mention that the Tower of David was exposed to the bedrock during their excavation, “except for its north-western corner which was built on small stones and debris.” The bedrock at this point is 766.65 meters (2515.26 feet) above sea level. Everyone who reads this blog probably knows that the walls surrounding the Old City of Jerusalem date to the Turkish period, built in the 16th century A.D.
More about the Citadel and a visit to the Kishle in post(s) to come. The photos in this post are sized for use in PowerPoint presentations for the classroom. I hope some of you will find them useful. Publication requires the usual licensing. We have been awaiting the unveiling of this document for several days. A leaked account made it to the papers a couple of days ago, but I decided to wait until we had official word from the Israel Antiquities Authority. Today we have this information. In a complex enforcement operation, inspectors of the Israel Antiquities Authority seized a papyrus that includes the earliest reference to Jerusalem in an extra-biblical document, which is written in ancient Hebrew script and dates to the time of the Kingdom of Judah. The document, which was illicitly plundered from one of the Judean Desert caves by a band of antiquities robbers and was seized in a complex operation by the IAA’s Unit for the Prevention of Antiquities Robbery, was presented today (Wednesday) in a press [release] of the Israel Antiquities Authority. Rare 7th century B.C. Hebrew papyrus document bearing the name of Jerusalem. Photo Shai Halevi, Israel Antiquities Authority. Hebrew papyrus document from 7th century B.C. preserved by the Israel Antiquities Authority. Photo by Shai Halevi. Israel Prize laureate and biblical scholar Prof. (Emeritus) Shmuel Ahituv attests to the scientific importance of the document, “It’s not just that this papyrus is the earliest extra-biblical source to mention Jerusalem in Hebrew writing; it is the fact that to date no other documents written on papyrus dating to the First Temple period have been discovered in Israel, except one from Wadi Murabbaʽat. Also outstanding in the document is the unusual status of a woman in the administration of the Kingdom of Judah in the seventh century BCE”. According to the Minister of Culture and Sport, MK Miri Regev, “The discovery of the papyrus on which the name of our capital Jerusalem is written is further tangible evidence that Jerusalem was and will remain the eternal capital of the Jewish people. It is our duty to take care of the plundering of antiquities that occurs in the Judean Desert, and no less important than this is exposing the deceit of false propaganda as is once again happening today in UNESCO. The Temple Mount, the very heart of Jerusalem and Israel, will remain the holiest place for the Jewish people, even if UNESCO ratifies the false and unfortunate decision another ten times”. According to Pnina Shor, curator and director of the Dead Sea Scrolls project at the Israel Antiquities Authority, “This unique papyrus joins the thousands of scroll fragments for which the Israel Antiquities Authority established dedicated conservation and photographic laboratories where the scrolls are treated using highly sophisticated means and the most advanced documentation and photographic technology available today. With a state-of-the-art camera that was developed based on technology used by NASA which records the Dead Sea Scrolls at a level that replicates the original, it is even possible to see the texture of the plant, skin or parchment on which the ancient documents were written”. Preliminary results of the research findings will be presented tomorrow (Thursday) at the conference “Innovations in the Archaeology of Jerusalem and its Region”, which will be held on the Mount Scopus campus of the Hebrew University of Jerusalem and be open to the public. Is it genuine? Could it be a forgery? On general principles I would be tempted to file an unprovenanced 7th-8th century BCE Hebrew papyrus that happens to mention Jerusalem under “likely too good to be true.” But apparently it was seized by the IAA rather than, as originally reported, being bought from an antiquities dealer. (Or at least, it is not yet clear how the two reports fit together.) And the radiocarbon dating of the papyrus is important. 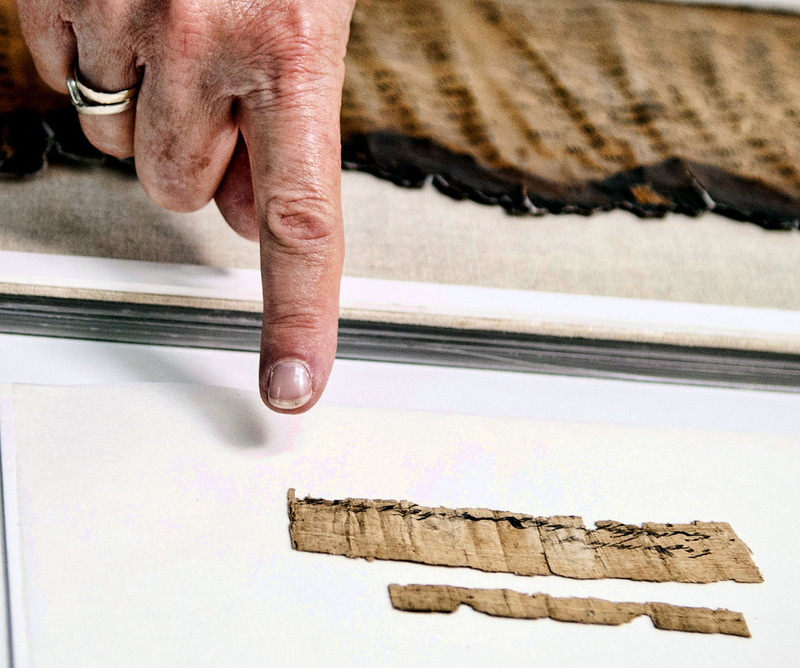 It is not entirely impossible that a forger would be able to get hold of a blank papyrus fragment dating to the 7th-8th century BCE, but it seems very unlikely. And even then, how would the forger be sure enough of the date to make the script of the Hebrew match so well? So I think it is very probable that the papyrus and the inscription on it are genuine and that we should proceed with that as our preliminary conclusion, as the IAA is doing. Sometimes we are just lucky. And there is more, here. There is abundant evidence of the presence of the Romans in Jerusalem and the land they would later call Palestine. Now comes specific evidence of the place where Titus’ army breached the Third Wall of the city. The excavation site in the Russian Compound. One can see the wall and sling stones on the floor, which are tangible evidence of the battle that was waged here 2,000 years ago. Photographic credit: Yoli Shwartz, courtesy of the Israel Antiquities Authority. The Israel Antiquities Authority released this information earlier today. Impressive and fascinating evidence of the battlefield and the breaching of the Third Wall that surrounded Jerusalem at the end of the Second Temple period was uncovered last winter in the Russian Compound in the city center. 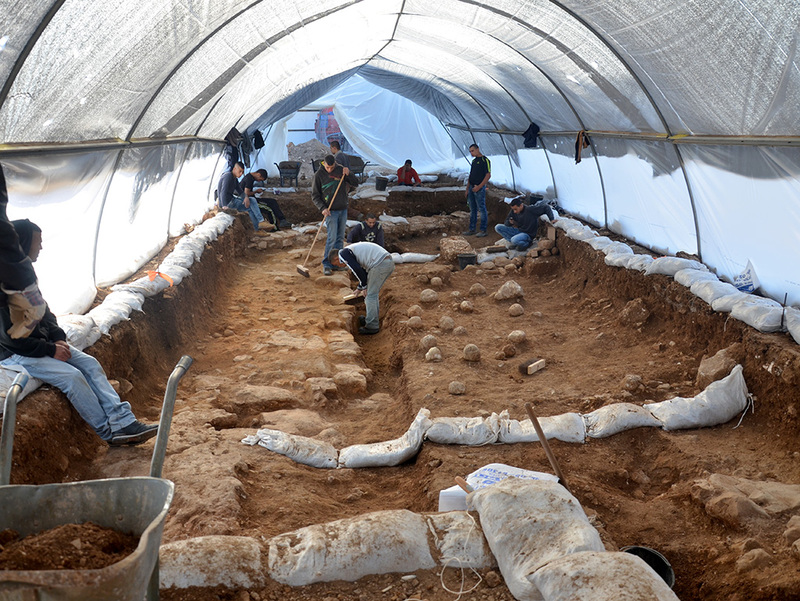 The finds were discovered in an archaeological excavation the Israel Antiquities Authority conducted in the location where the new campus of the Bezalel Academy of Arts and Design is slated to be constructed. During the course of the excavation archaeologists discovered the remains of a tower jutting from the city wall. Opposite the tower’s western facade were scores of ballista and sling stones that the Romans had fired from catapults towards the Jewish guards defending the wall, who were stationed at the top of the tower. 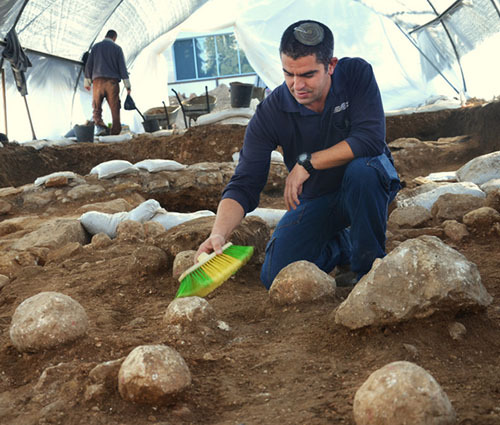 Kfir Arbib, excavation director on behalf of the Israel Antiquities Authority, cleans one of the sling stones. Photographic credit: Yoli Shwartz, courtesy of the Israel Antiquities Authority. 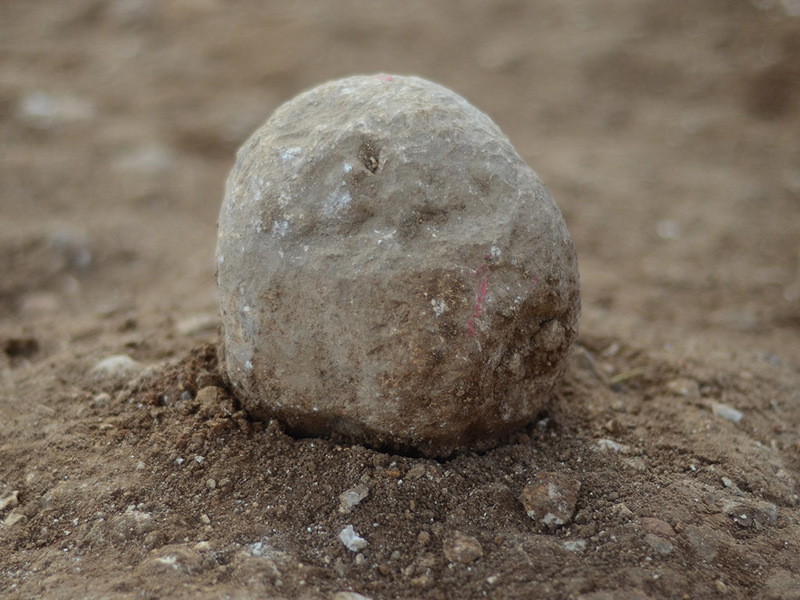 According to Dr. Rina Avner and Kfir Arbib, excavation directors on behalf of the Israel Antiquities Authority, “This is a fascinating testimony of the intensive bombardment by the Roman army, led by Titus, on their way to conquering the city and destroying the Second Temple. The bombardment was intended to attack the sentries guarding the wall and provide cover for the Roman forces so they could approach the wall with battering rams and thereby breach the city’s defenses”. The historian Josephus, an eye witness to the war, provided many details about this wall. According to him, the wall was designed to protect the new quarter of the city that had developed outside its boundaries, north of the two existing city walls. This quarter was named Beit Zeita. The building of the Third Wall was begun by Agrippa I; however, he suspended its construction so as not to incur the wrath of Emperor Claudius and to dispel any doubts regarding his loyalty. 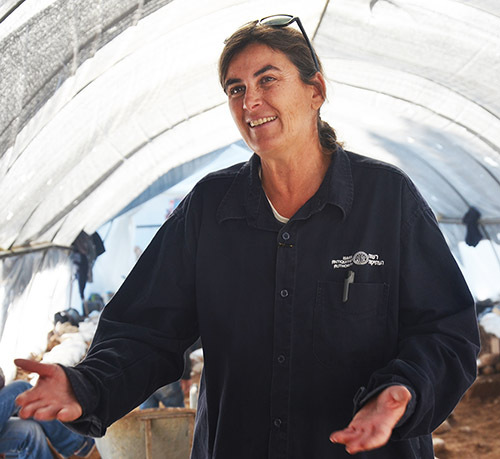 The construction of the Third Wall was resumed some two decades later by the defenders of Jerusalem, as part of fortifying the city and the Jewish rebels’ preparations for the Great Revolt against Rome.
. Dr. Rina Avner, excavation director on behalf of the Israel Antiquities Authority. Photographic credit: Yoli Shwartz, courtesy of the Israel Antiquities Authority. One of the sling stones on the floor, tangible evidence of the battle that was waged here 2,000 years ago. Photographic credit: Yoli Shwartz, courtesy of the IAA. An unresolved debate among researchers has been going from the early twentieth century up until the current excavation as to the identity of the Third Wall and the question concerning Jerusalem’s boundaries on the eve of the Roman onslaught led by Titus. It seems that the new discovery in the Russian Compound is proof of the wall’s existence in this area.
. A spearhead from the battle against Titus’ army. Photographic credit: Clara Amit, courtesy of the Israel Antiquities Authority. 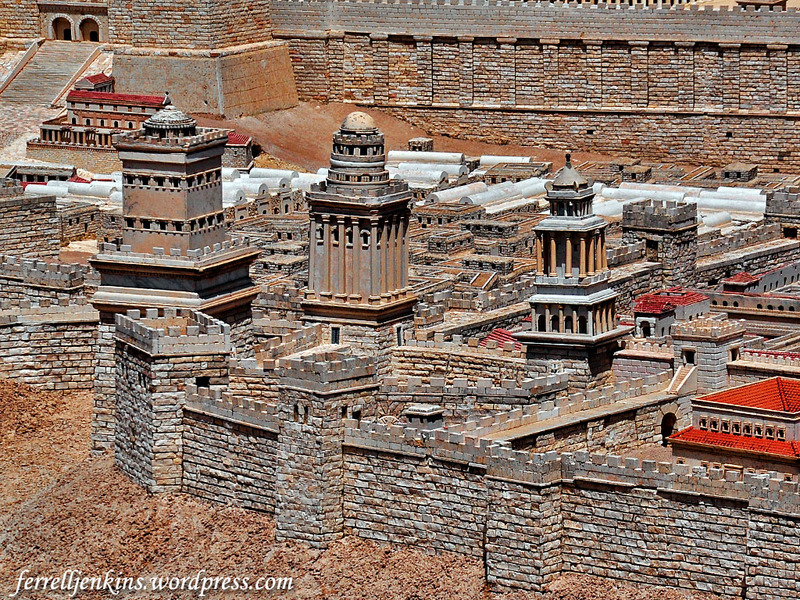 Christians see the A.D. 70 destruction of Jerusalem as a fulfillment of the prophecy of Jesus. Some of the photos can be enlarged by clicking on the image. HT: Joseph Lauer, several Israeli newspapers. Balmoral is the Scottish home to the British Royal Family. 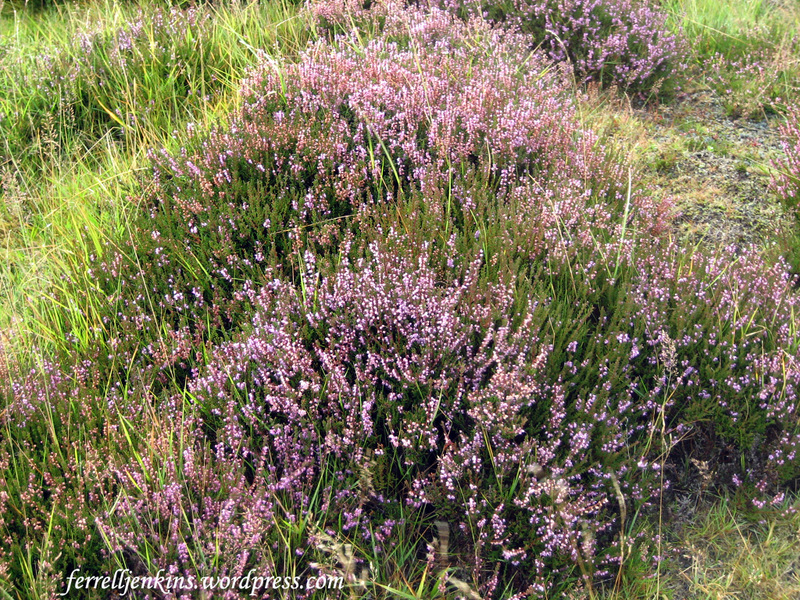 At certain times of the year the rugged terrain of the region is ablaze with the famous “heather on the hill” that we learned about in Brigadoon. Our photo below was made near Balmoral in mid-September, 2007. “Heather on the hill” near Balmoral, Scotland. Photo by Ferrell Jenkins. Why did Abraham go to Hebron? A reader sent an Email complimenting the blog and asking for help in answering a question. Not sure that I will be able to satisfy the curiosity of the reader, but perhaps these comments will help. Let’s begin with a survey of Abraham’s early time in the land of Canaan. (All of the references are to the book of Genesis unless otherwise indicated.) I suggest that you follow along in your Bible atlas. View west to the Shechem valley between Mount Gerizim (left) and Mount Ebal (right). Photo by Ferrell Jenkins. First stop at Shechem (Genesis 12:6). Later he settled between Bethel and Ai (12:8). Took a trip to Egypt and then returned to the Negev before going back between Bethel and Ai (12:10; 13:1, 3). There was not available land to accommodate the herds of both Abraham and Lot (13:6). Important fact. The Canaanite and Perizites were in the land. Abraham and Lot were strangers and had to move to empty spaces, or perhaps negotiate grazing rights. Lot chose to go to the well-watered Jordan Valley as far as Sodom (13:10). The LORD spoke to Abraham. “The LORD said to Abram, after Lot had separated from him, ‘Lift up your eyes and look from the place where you are, northward and southward and eastward and westward, for all the land that you see I will give to you and to your offspring forever. I will make your offspring as the dust of the earth, so that if one can count the dust of the earth, your offspring also can be counted'” (13:14-16 ESV). The LORD instructed Abraham: “Arise, walk through the length and the breadth of the land, for I will give it to you.” (13:17 ESV). “So Abram moved his tent and came and settled by the oaks of Mamre, which are at Hebron, and there he built an altar to the LORD” (13:18 ESV). Abram later rescued Lot at Dan, and continued to chase the eastern armies north of Damascus (14:14). A statement of the extent of the promised land is given in 15:18. Abram later lived in Beersheba (21:31). 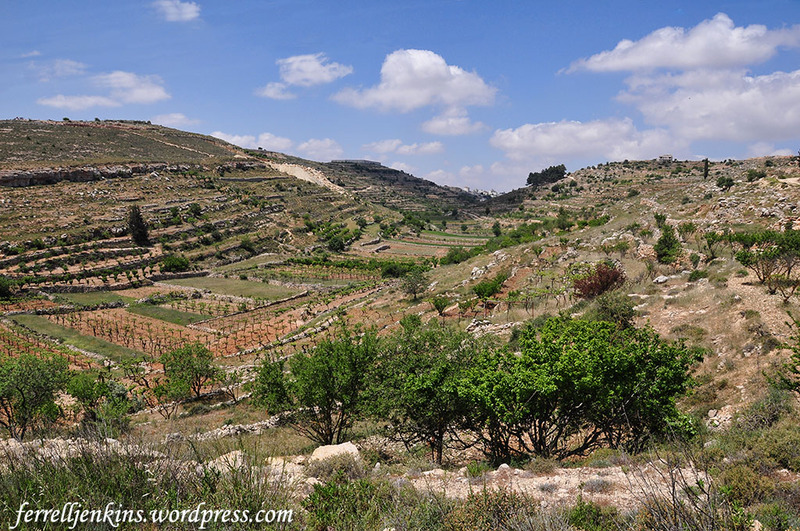 A beautiful, fertile valley along the central mountain range between Bethlehem and Hebron. Photo by Ferrell Jenkins. Answer. The trip to Hebron was simply part of the overall plan to walk the land that the LORD was to give to Abraham’s descendants. The central mountain range is sometimes identified today as the Patriarchs Way or Route. 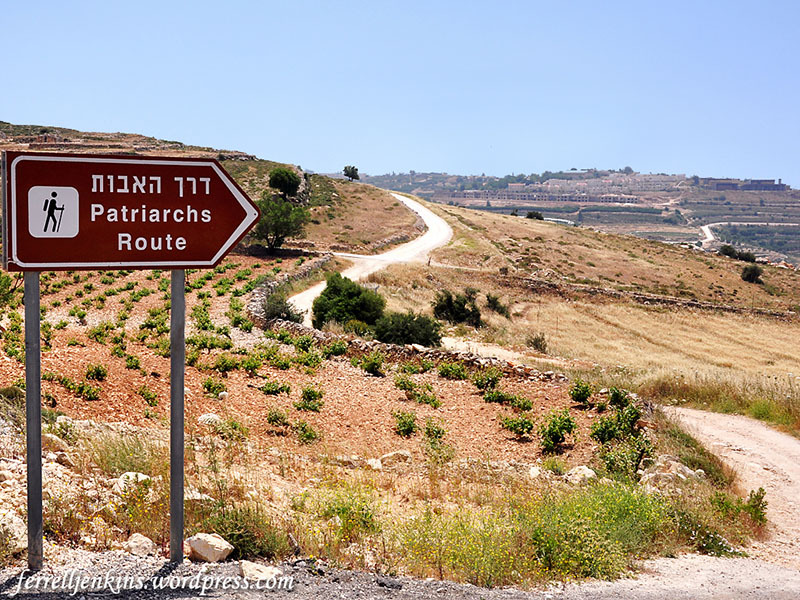 Patriarchs Route between Bethlehem and Hebron. Photo by Ferrell Jenkins. From time to time I have cited The IVP Bible Background Commentary: Old Testament because it provides succinct comments related to the cultural background of biblical events. The cave of Machpelah, burial place of Abraham and Sarah, and others from the patriarchal period. Photo by Ferrell Jenkins. Understanding the land helps one better understand the biblical text. Frequently over the years I have had tour members ask me, “What is that building?” as they pointed to the building with golden onion tops. The simple answer is that this is the Russian Garden of Gethsemane. More specifically, the building is known as the Church of St. Mary Magdalene. 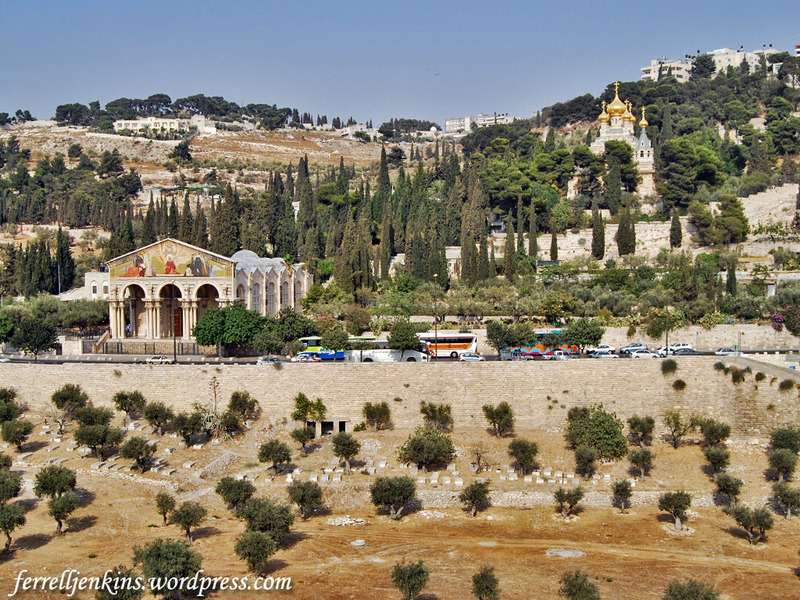 The Church of All Nations (left) and the Church of St. Mary Magdalene on the Mount of Olives. Photo by Ferrell Jenkins. No one can be sure of the exact spot at which he prayed, but this limited area was certainly close to the natural route leading from the Temple to the summit of the Mount of Olives and the ridge leading to Bethany. (The Holy Land, 5th ed., p. 147). The New Testament account explains that the disciples of Jesus went with him to the Mount of Olives (Matthew 26:30), to a placed called Gethsemane. Prince Phillip is said to have visited the Church in 1994. Princess Andrew of Greece (Princess Alice of Battenberg), mother of the Duke of Edinburgh visited the church and stayed in the monastery in the 1930s. Her wish was to be buried near her Aunt ‘Ella’, the Grand-Duchess Elizabeth whose devotion to the church and to nursing and charitable service she strove to emulate. Princess Andrew died at Buckingham Palace in 1969. Her wish to be buried at the Convent of Saint Mary Magdalene in Gethsemane was finally realized in 1988 when her remains were transferred to her final resting place in a crypt below the church. The church stands in the Garden of Gethsemane, the place where Jesus spent His last night on earth. Also found on the convent grounds are the remnants of a pre-Roman road, the biblical entry to Jerusalem. Not far from this road is a large stone on to which the Mother of God dropped her cincture to Apostle Thomas on the third day following her Dormition.